A group of legal eagles have taken part in a mammoth golf marathon to raise money for Macmillan Cancer Support. Playing four consecutive rounds at The Mond Valley Golf Club in Clydach, the four-strong team aims to raise much-needed funds for the cancer charity. The team was put together by Neath solicitor Darren Davies of Hutchinson Thomas and included his colleagues Adrian Morley and Phillip Lewis as well as barrister Robin Rouch. While staff at Hutchinson Thomas’ office wore green for the day in support of their colleagues’ sporting challenge. Keen golfer Darren, who is a partner in the firm’s litigation department, said it had been a long, but a very enjoyable day. “We started at 5.40am and in total played 72 holes of golf, and walked about 23 miles and finished at 8.10pm. 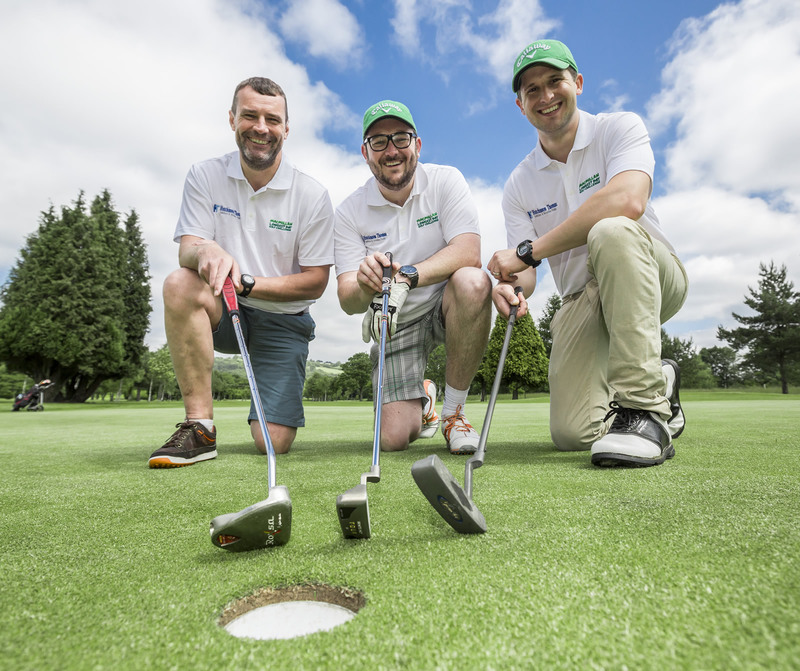 The golf day was launched prior to the event at a fundraising lunch hosted by Hutchinson Thomas and attended by over 130 representatives from local businesses across the Swansea Bay area. Held at the town’s Castle Hotel – birthplace of the Welsh Rugby Union – the guest speaker was appropriately international rugby referee Nigel Owens, who has personal experience of Macmillan’s care and dedication. Hutchinson Thomas carries out a broad range of work for individual and commercial clients. It promotes itself as “the clear-thinking firm”. The firm is an amalgamation of two well-established practices. Messrs L C Thomas & Son, founded in 1872, merged in 1999 with Messrs R B Hutchinson Morris & Harrett, which traces its roots back to the early part of the 20th Century. It aims to combine the role of the traditional family solicitor with a modern, energetic and pro-active approach. Clients are entitled to high standards of work and staff at every level have an important part to play in the running of the firm. Hutchinson Thomas provides a quality legal service in a wide range of areas, serving the community of Neath and surrounding districts, as well as attracting clients from across England and Wales. The firm is proud of its high professional standards and is accredited by Lexcel and the Legal Aid Agency, and it is recommended in the Legal 500.